A relaxed lunch at Zucca last week with Mr G was a great chance to chat about wine and mostly racing (that’s horses for those inclined to think there is any other type of racing). We started off with a glass of Franciacorta then got straight into a lovely bottle of Corton-Charlemagne 2006 from Bonneau du Martray. I am a little sceptical about a lot of 2006 white Burgundies I think they are biggish, round and probably best drunk sooner for their exuberance rather than kept too long. As with everything there will be exceptions but I would drink 2006 before 2004 and 2007 for sure. This was a slightly different kettle of fish, it has depth but is still lemon fresh and whilst lovely now probably not yet at its peak, it disappeared quickly. A lovely start. The first red was Chambertin Grand Cru 1990, Rousseau. A wine I am getting to know better and better courtesy of a few friends (see here), but I had never had the 1990. There is an animal quality about these wines that makes them, to my mind, some of the richest and most savoury of all the red Burgundies. I think of Rousseau’s Chambertin as being 85% Burgundy and 15% Northern Rhone, the later adding a touch of “animal”. This 1990 was really great, sweet dark but bright fruit with spice rather than pepper, a lovely finish and just the right amount of grip. I would say it is between stage 2 and 3 of development and comes very much recommended…the pasta with ox ragu was great with it. A couple of Barolo‘s followed. Rinaldi’s Cannubbio San Lorenzo Ravera 2006 and then Granbussia Riserva 1999 from Aldo Conterno. Both showed well and yes both are not yet at their peak BUT as I had l always maintained, in my opinion, a great wine is always a great wine and even when young can be enjoyed as such. This is not to say wines can’t shut down because they can but even then you can tell class by the texture and balance however muted. 2006 is a Barolo vintage that I never tire of, which is good as I own a fair bit of it, yes it is structured and will repay the patient but it has real class and is very true to Nebbiolo. 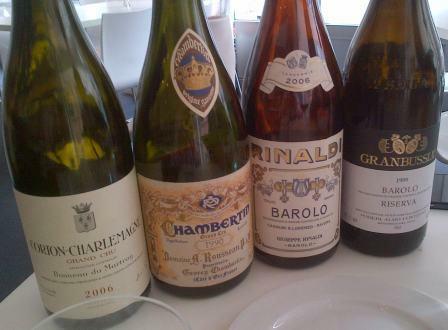 Uncompromising is may be the best word, a good thing in a wine world where too many wines are a “nod” to something else. Beppe Rinaldi is a legend and this sort of wine shows why, intensity, purity, depth and also spice, truly multidimensional. The Aldo Conterno was very fine also. I am, as regular readers will know, a lover of very traditional Piedmont wines as made by Beppe Rinaldi and Roberto Conterno amongst many others. Aldo’s wine come from the other side of the fence, this was delicious, more textured and showing well, young yes and with years ahead but balanced and very fine, darker fruits, blacker fruits, not bruised.